Distortion pedals are relatively plain contraptions – they’re most commonly used by “heavy” musicians, but their field of application is virtually limitless. There are numerous brands that utilize various technologies and tech parts, so it’s safe to say that every distortion pedal is different – the market is quite large, so the catalogue from which you’ll be choosing should be narrowed down a little, and that’s where we come in. First of all, let’s start with the basics. HOW TO CHOOSE A RIGHT DISTORTION PEDAL? HOW SHOULD I USE MY DISTORTION PEDAL? Generally, a distortion pedal distorts the sound an instrument makes. There are bass guitar distortion pedals which specialize in distorting the lowest frequencies, whereas guitar distortion pedals are more versatile and richer in terms of sound output. From a theoretical point of view, a distortion pedal can be used with any wired instrument – ukuleles, semi-acoustic guitars, semi-acoustic violins, and so on. The reason why you shouldn’t do that is quite obvious – you may end up ruining your amp. The way a pedal distorts the sound may sound a bit too scientific, but you’ll get the picture quite fast. Basically, while you play your instrument, your amp is generating sound waves. By introducing a distortion pedal to the stage, these sound waves get distorted – they change in length in shape. In short – your pedal recognizes the frequencies emitted by your instrument and clips them, alters them. In essence, both distortion and overdrive represent effects which alter the original sound of an instrument. While distortion heavily clips the sound waves, overdrive simply muddies it up. Certain musicians who play heavy music (such as virtually all sub-genres of metal music) rely on distortion to achieve the sound they need. Overdrive can achieve a similar effect to that of the old-school tube amps, or true amp distortion – the latter is a sub-type of distortion effect achieved on amps, rather than pedals, effects, and such. Depending on your skill level and experience, a distortion pedal could be a useful tool to achieve the perfect sound or a complex contraption which you’ll seldom use. Beginners should most certainly settle for usability – basic distortion pedals often come with three knobs (low, mid, and high) which are both self-explanatory and easy to use. Musicians with experience with this matter more often than not go with versatile distortion pedals - the ones which come with a plethora of knobs, such as boost, multiple channels, hi-gain, along with the usual 3-band EQ settings. As we’ve said before, distortion pedals are mainly used by metal musicians. The “distortion” effect could be valuable in other musical genres, but it’s virtually reserved for heavier music types, but even so, choosing the pedal in accordance to your metal preferences can be quite hard. Namely, there are as many metal sub-genres as there are other (non-metal) music genres. Certain sub-types rely on heavy distortion (note that all distortions are heavy already) which, in combination with deep guitar tunings provide a massive, ground-shaking sound. Such types are doom, sludge, death, and black metal, for example. The category of metal sub-genres which are in the golden middle rely on moderately distorted sounds, such as speed and thrash metal, for instance. It’s only normal that you’re searching for the best distortion pedal within your budget range, but how exactly does the quality criteria change as the price goes up? You might find it hard to believe, but there are pedals that cost well above $1000, even though it’s safe to assume that most musicians are content with $100-$200 pedals. That being said, the bare minimum of cash you’d be willing to invest in a distortion pedal shouldn’t be below $50. Sure, there are some brands that make budget effect pedals, but more often than not, these are cheap pedals that offer nothing more than plastic, cranky sound. Should you be in a position where investing $100 isn’t that big of a deal, there’s a plethora of high-quality models you could enjoy in. In essence, budget distortion pedals come with plain settings – in best-case scenarios, you’ll have a couple of basic equalizer knobs and the simplest drive/gain setting, whereas versatile (more expensive) distortion pedals feature a plethora of knobs, allow for better sound and effect customization, respond faster, and generally perform better. Using a distortion pedal might yield different results sound-wise depending on the gear you have. Some amps (specifically tube amps) are meant to be played without effects – such a thing is possible, sure, but you wouldn’t utilize your pedal to the max that way. Other amps (digital amps in general) come with their own pedals which are called foot-switches. These are specialized pedals that perform different tasks, depending on the brand and the amp in question. Your guitar has a serious impact on how the pedal will work – the setup and pickups most of all. “Setup” guitars already sound quite good, and you will get the most out of your distortion if you have one – the ones which were purposefully tinkered with in such a way that they “catch” vibrations more easily. In essence, some pedals will work marvellously on cheap guitars – for instance, entry-level Fender guitars are seldom used in metal world, and it comes as a surprise that a British Stack Grunge “Overdrive” pedal sounds like a distortion pedal on it. There are cases where budget guitars combined with budget pedals give surprisingly positive results, but we shouldn’t make a rule out of it. Knowing this, you should think twice before you purchase your distortion pedal. If you’re content with how the “cleans” sound, there are high chances that you’d be happy with how a distortion pedal could spice that sound up. Most beginners make the simplest mistakes by thinking that all you have to do is simply “plug the pedal in and enjoy”. The truth is – those little buttons won’t provide the “best distortion ever” if you switch them to the max, just like your other pedals won’t perform as good if they’re aligned randomly. That leads us to two important questions – where should you put your pedal, and how should you tweak the knobs on your distortion pedal? Ideally, gain & effect pedals should come after compressors, filters, and volume shifting pedals. The latter often comprise the primary chain group, right after which gain pedals (including the overdrive & distortion) come into play. If you’re interested in how you should continue your chain, modulation effects are 3rd in line (chorus, phasers), time-based effects are 4th (delays, for instance), and so on (usually, most people don’t go beyond this point). These knobs are found on nearly every distortion pedal, and they represent the strength of particular frequencies (e.g. low = the strength of the lowest frequencies). Ideally, flip all the knobs at 12 o’ clock angle (roughly at 50%), pluck the strings with one hand while turning each knob a bit in either direction. The tone will gradually start to gain (or lose) clarity and definition (based on the direction of knobs). As for metal music, set the drive at half strength (6 o’clock), the tone somewhere between 7 and 8, and lows at 5. Basically, the “Gain” knob is your distortion’s “distortion”. It adds “mass” & “dirt” to your distortion pedal’s sound, and most beginners think of it as a “shortcut for the heaviest sounds”. Use the “gain” knob to accentuate and stabilize the tone you’ve previously achieved (while tweaking the equalizer knobs), but remember, cranking it up to the max won’t contribute to your sound – you’ll get a muddy, massive noise which can’t be compared to actual “tone”. The “tone” knob is your distortion pedal’s “fine-tuning”. By using this knob, you can “define” your distortion (specify the amount of tone alteration, to be more precise). While “gain/boost” functions define the level of your distortion, the “tone” knob defines the amount of “clarity” behind it. Even though it seems paradoxical, a distorted sound can be “clear” and “heavy” at the same time – most technical (metal in particular) genres are defined by this sound. Boost is sometimes labelled as the “distortion’s distorted drive”. It’s the 2nd level of distortion you’ll get when pressing the corresponding button, and it’s safe to say that you’ll want to do this only, and only if you’re a metal musician. In a nutshell, the “boost” buttons (regardless of the name and variation) amplify all frequencies, volume, and signal strength, which basically means that you’ll get a louder, rougher sound with a flip of a switch. The first distortion pedal in our reviews comes from Boss – this brand earned its fame decades ago, and most musicians know that their distortion pedals are among the heaviest, as well as the most reliable ones. The DS-1 in particular features a rugged, durable construction, although the design is pretty much the same as with their other models. Aesthetics aside, this distortion pedal is pretty cool for the cash, not to mention that it belongs to the “budget” price point category. It’s one of the most straightforward distortion effect pedals you’d come across in your search – it features only three knobs, and it’s practically ideal for metalheads and rockers who don’t want to spend an entire afternoon figuring which end goes where. The tone knob defines the sound alteration direction – as you turn this knob up, you’ll notice a boost in distortion’s clarity, although it might be best to leave it at 12 o’ clock if you’re unsure how to achieve the best tonal configuration. The level is pretty much synonymous with volume – turning it up will simply amplify the strength of frequencies without venturing into the sphere of heaviness, as that’s what “dist” is for (short for distortion). Since this is one of the most straightforward pedals out there, heavy and thrash metal guitarists could benefit the most from it. One of the most reliable distortion pedals. Plain and simple to use. It would be good as a second, or even a third pedal, but you shouldn’t rely on it solo. ElectroHarmonix Soul Food Distortion is somewhat of a hybrid pedal which features elements of fuzz, distortion, and drive effects. Basically, the aforementioned represent separate guitar effects which are mostly based on the overdrive function, which means it would be great if used on a tube amp. There are only three knobs – the volume which governs the strength of frequencies, the drive which is a sort of a distortion boost, and the treble which mimics the effects of “middle frequencies” found on similar pedals. The only problem with this pedal is that it lacks the “lows”. Namely, the treble knob will give you access to mid-range frequency customization, the drive will fuzz up the highs, but there are no means by which you’ll set up the lowest frequencies in the way you’d want. Overall, it’s pretty good for the cash. This pedal is practically ideal for heavy metal musicians. It muddies up the sound with a combination of fuzz and moderately rich distortion, which comes perfect for this genre of music. Superb value for the money. Excellent mid & high potential. Goes well with most amp types. Costs a bit above average. 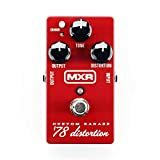 MXR is another world-class leader in the guitar tech industry, and here we have one of the classiest distortion pedals that market has to offer. Namely, the “Custom Badass” was built with one thing in mind – recreating the old-school buzz which blasted the metal scene away back when it gained fame (mid 70s and early 80s). Let’s be clear on one point – this distortion pedal is for hard rockers and metalheads who want to get the most out of their amp, not the other way around. Both the tone and distortion of this pedal are quite unique, so you’ll either love it or hate it. There are three knobs and the “Crunch” switch – the latter will pump up the configuration you’ve made. Tone stands for sound accuracy, the output governs the strength of the frequencies while the distortion muddies up the aforementioned two. Overall, this is an exquisite piece of accessorial technology, and we highly recommend it for its superb sound-alteration properties, but don’t forget that it’s meant for old-school enthusiasts. New-school players (djent, tech-metal, and such) are most likely to find it as mediocre at best. Outstanding harmonic boost (crunch button). Easy sound customization and configuration due to plain 3-band EQ. It’s practically reserved for “old-school” musicians due to peculiar soundset. The super high-gain distortion Three band EQ with sweepable mid frequencies Tight, fast, switchable Noise Gate for syncopated metal. Here’s another gem from the MXR – the M116 Fullbore Metal might be the only way to spell “brutal” in the world of things heavy and dark. At the same time, this is the first distortion metal pedal which features a 6-band equalizer, meaning that it features six control knobs (disregarding the 2 additional effect buttons). The “Main” equalizer features low, mid, and high control knobs while the “Side” equalizer (top) features volume, frequency, and gain controls. With these little turrets you can adjust and customize virtually all aspects of your sound. One thing that people tend to like the most about this outstanding pedal is the exceptionally high distortion. At first it might appear as muddy and damp, but with some practice, you’ll be able to find the heaviest, most brutal tones. Since the “fullbore metal” distortion pedal features a high-gain crunch complemented with a highly customizable setup, it’s best for musicians who prefer more extreme metal genres (death metal, technical metal, and such). Complex, but still fairly easy to use. Not usable by rockers – the gain is just too high. Electro-Harmonix might’ve made a bunch of high-quality pedals, but Metal Muff takes the prime spot. This is most certainly one of the best distortion pedal models you’ll come across, and that’s if you’ve already left no stone unturned. First of all, this is a moderately-complex distortion pedal. It features six control knobs, a boost button, and the bypass button (comes in handy if your amp already has gain buttons). There’re just so many things you could do with it, but if you’re looking for a nasty, sharp distortion adorned with a deep, clear bass, you’ve got what you needed. It does cost a little more than an average effect pedal, though, but it’s more than valuable for the cash. Metal Muff packs quite a punch, and it’s safe to assume that heavy, thrash, and speed metal guitarists should benefit the most from it. Easy to use despite its moderately-complex nature. “Boost” to achieve ground-shaking effects. The last distortion pedal in our review comes from Pro Co. 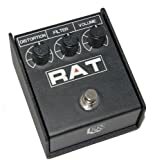 Even though these guys might not be as famous as MXR or Boss, they’ve certainly earned their salt with the Rat2 distortion pedal. It offers a true distortion experience, which means that this would be your primary distortion. It alters the sound waves in such a way that they’re comparable to that of a tube amp gain, but it’s safe to say that it can go a bit further in terms of crunch and fuzz. There are only three knobs – the distortion for strength, filter for clarity, and the volume. It’s plain and straightforward, but it does the job perfectly well. It’s simple and decently powerful, and it could come in handy for most commercial metal types (speed, thrash, heavy). Plain and easy to use. Ideal for beginners and most metal genres. No flaws regarding quality, only it can’t really compare to high-end models in any field. Finding and picking the best distortion pedal shouldn’t come too hard on you. Surely enough, there’s a bunch of things you should consider but is there really such a thing as “bad” distortion effect? Even if you happen to get a medicore pedal and end up with a sound you didn’t like, you’ll know what you don’t want in your sound. That’s the first step, as recognizing quality won’t come overnight. You’ll have to search through trial and error, but you’ll come around eventually. Best budget distortion pedal – Electro-Harmonix Soul Food distortion pedal. Best versatile distortion pedal – Electro-Harmonix Metal Muff. Best “crunch/drive” distortion pedal – MXR Custom Badass. 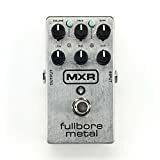 Best metal distortion pedal – MXR Fullbore Metal. Best rock distortion pedal – ProCo RAT2. Consider checking out the buying guide, as the tips contained inside might be of some real value to you – some things could be learnt the easier way. We hope you liked our reviews!